Filing income taxes can be tricky, but free resource in Middle Tennessee could help tens of thousands of people. 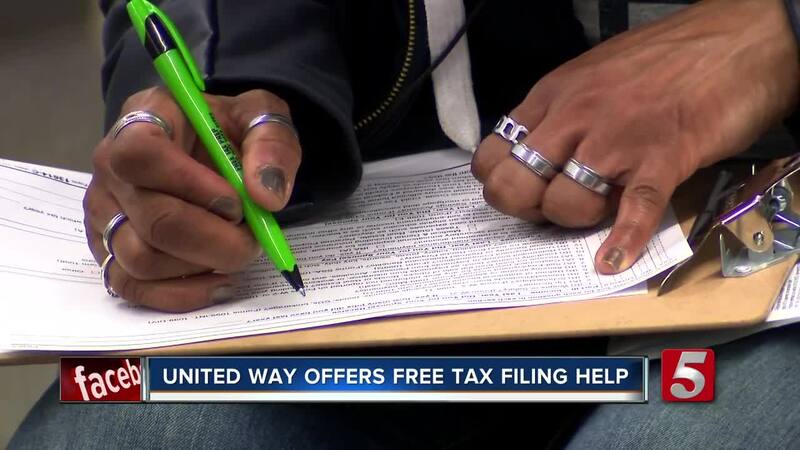 NASHVILLE, Tenn. (WTVF) — Filing income taxes can be tricky, but free resource in Middle Tennessee could help tens of thousands of people. The United Way of Nashville’s Volunteer Income Tax Assistance Program helps almost 14,000 taxpayers every year. “With my taxes it’s a little difficult, so I just appreciate the thoroughness of them looking it over to make sure everything is correct,” said taxpayer Angela Jackson. Jackson has used the VITA program for four years and never had an issue. “I just appreciate the fact that people donate their time to assist in this matter,” said Jackson. So far the VITA program has brought back more than $17.7 million to the community in the form of tax refunds. Every day from now until April volunteer tax professionals will file taxes for free as long as a client’s household income didn’t exceed $66,000 in 2018. “We don’t serve nearly the amount of people that we can because they don’t know about our program,” said United Way Director of Financial Stability Tracey Dill. Dill believes this service can help people find the financial footing they need to get out of poverty. “We save tax payers on average around $273. So that’s their money, that’s money that they’re able to put that money back into their pocket and they don’t have to pay someone to do their taxes for them and that’s food, that’s rent, that’s clothing,” said Dill. Tax professionals say not filing properly can cost you big time in the long run. These volunteers are highly trained by the IRS to help qualifying clients receive important credits like the Earned Income Tax Credit, The Child Tax Credit. That brings fulfillment to volunteers like Ruth White. “Most people are very grateful. Very grateful and say thank you so much for volunteering,” said VITA volunteer Ruth White. More than 300 volunteers ranging from retired accountants to university students make the program possible, but they’re always looking for more volunteers. • Woodbine Super Site, 635 Spence Lane, Nashville; Opens Jan. 28, 2019. Walk-in only. Mon, Wed: 9 a.m.
to 6 p.m.; Fri: 9 a.m. to noon; Sat: 9 a.m. to 2 p.m.
only. Mon: 9 a.m. to noon; Tue, Thur: 9 a.m. to 7 p.m.; Sat: 9 a.m. to 2 p.m.
12:30 p.m., 4 to 7 p.m.; Tue: 9 a.m. to noon; Wed: 9 a.m. to noon; Sat: 10 a.m. to 2 p.m.
required: 615-320-5152. Mon, Wed: 9 a.m. to noon, 1 to 6 p.m.; Tue, Thur: 9 a.m. to noon, 1 to 4 p.m. Noon to 4 p.m.; Sun: 2 to 4 p.m.
and 23; March 9 and 23; April 13). 615-350-7893. Tue-Thu: 9 a.m. to 3 p.m.
only. Sat: 9 a.m. to 5 p.m.
7940. Thur: 9 a.m. to noon. 615-830-7940. Tue: 9 a.m. to 2 p.m.
• Triangle School, 7120 Westview Dr., Fairview, TN; Opens Jan. 26. Appointment required: 615-830-7940. Feb. 29: 3 to 7 p.m.; Sat: 9 a.m. to 1 p.m.
software questions, but you will prepare your own return. Wed: 5 to 8 p.m.
• Patterson Park Community Center, 521 Mercury Blvd., Murfreesboro, TN; Opens Feb. 1. Walk-in only. Tue, Thur, Fri: 1 to 7 p.m.; Sat: 9 a.m. to 2 p.m., Sun: 2 to 5 p.m.
2 to 7 p.m.; Sat: 9 a.m. to 1 p.m.